Here is what I have to look forward to…..Delicate white blooms with ruffled, purple edges are carried above clumps of strap-like foliage. Prized for their large, open flowers, these oriental beauties are the last to flower in the iris family, but well worth waiting for. The pretty blooms of Iris ensata ‘Frilled Enchantment’ are perfect for adding to cut flower arrangements. 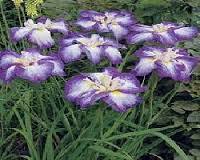 Japanese iris enjoy a reliably moist, boggy soil making them ideal for marginal planting around ponds. Height: (31″). Spread: (12″). Though I have nary a pond to place them near, I hope they will like their new home. 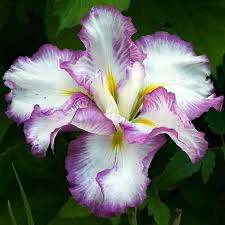 This entry was posted in Stepheny The Gardener and tagged Iris ensata 'Frilled Enchantment'. Bookmark the permalink. A lovely iris for a lovely lady from a lovely lady. Very beautiful iris (and belated Happy Birthday!). Sorry I missed seeing you yesterday–just too much else going on.